INCRDEIBLE HULK #148, Page #5. 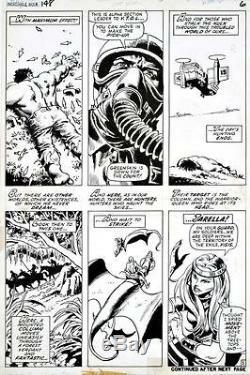 HERB TRIMPE Pencils and JOHN SEVERIN Inks. 11" X 17" in good condition. This is the original "one of a kind" art used to make the comic book. The item "HERB TRIMPE INCREDIBLE HULK #148 MARVEL Original Comic Book Bronze Art 1972" is in sale since Monday, June 27, 2016. This item is in the category "Collectibles\Comics\Original Comic Art\Interior Pages". The seller is "make_mine_marvel_1973" and is located in New York, New York. This item can be shipped worldwide.